How exciting is it when you, as a service provider, are able to serve a client that is in a completely foreign and unique industry? Enter Raines Polygraph Services. I have never branded a Polygraph company before and was thrilled when I was approached by Bobby to create his logo design and website for his business. Having been trained and certified in polygraph exams, Bobby was ready to launch out on his own to help people in Oklahoma and a few surrounding states. As we went through the discovery process, Bobby’s keywords were “Professional, modern, ethical, trustworthy, expert, and reliable.” These put him in the winter seasonal personality with an undertone of summer. With that, we set to work on crisp, clean and minimal logo marks that also had a geometric take to them. We ended up combing a version of the #1 submark with the layout of #6. He wanted a simple, masculine and professional brand that would also be approachable and trustworthy. When we thought about his colors, blue was a must for being a trusting, reliable, but approachable brand. Then we brought in an ice blue and bold rust color to complete his winter color palette. I’m happy with how crisp, clean, and bold his branding came out. We decided to continue with the same bold theme with his business cards, using a color block for the back side and his bold navy for the front side with a reversed logo. We went with a double thick matte business card that feels really substantial in hand. We also worked together to create his website at rainespolygraph.com, where you can learn more about Bobby, the types of exams he offers and his certifications and background in polygraph services. It was very refreshing and challenging to work on such a unique brand and I’m happy with how it came out. 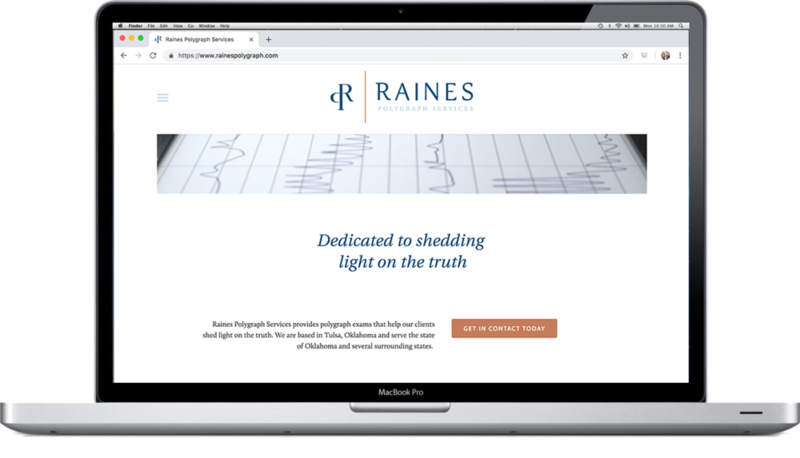 To learn more about Raines Polygraph Services, or to inquire for an exam, head to his website!